This multi-purpose glove is designed for tactical rescue responses, and offers a handful of features to make rescue operations more effective. Flexible: Three-dimensional design for optimal dexterity and flexibility. Cut Resistant:Spandex padding on back for abrasion, cut and tear resistance. 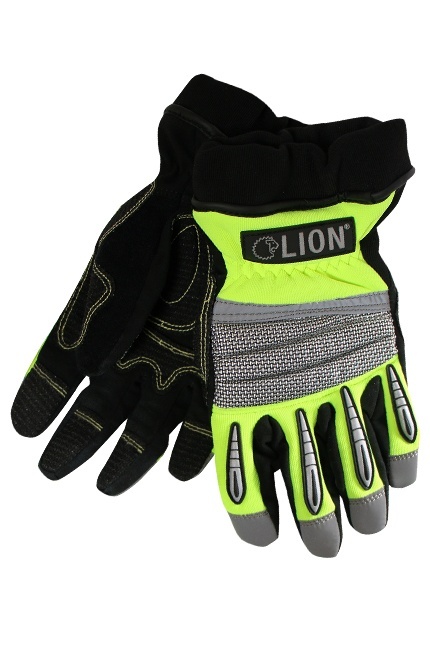 Highly Visible:High-visibility lime green reflective material on back of glove for increased visibility in night time extraction. Durable Construction:Tough, 100% nylon outer shell. Knuckle Padding: Padded knuckles with stretch for extra impact protection from the jagged metal and broken glass often associated with extractions. Reinforced for Strength: Armortex®/Kevlar®-reinforced palm and finger patches for outstanding dexterity and puncture resistance. Easy Donning/Doffing:Slip-on debris-control elastic cuff for easy donning easy and to keep gloves free of wreckage fragments and rubble. Leather Detailing:Tough, 100% nylon outer shell.